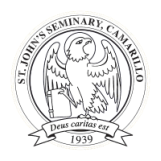 During a meeting of the Board of Trustees of the Los Angeles Roman Catholic Junior Seminary on March 3, 1927, it was announced that Juan E. Camarillo had offered the generous gift of 100 acres for the construction of a new theological seminary for the diocese of Los Angeles and San Diego. Construction of the new seminary was proposed to be completed within five years but the economic depression of 1929 forced the diocese to delay the project. A pastoral letter of Archbishop John J. Cantwell announced the proposed building of the Seminary and inaugurated the campaign for funds on January 14, 1938. Ground was broken in August. The cornerstone was inserted in the already erected building on March 19, 1939. Six months later on September 12, the Seminary opened its doors to seventy candidates for the priesthood. The Chapel was consecrated by Archbishop Cantwell on October 8, 1940. Six days later, before the assembled Hierarchy of the United States, the Apostolic Delegate, Archbishop Amleto Cicognani, dedicated the Seminary and the Edward Laurence Doheny Memorial Library while Archbishop Luis Martinez of Mexico City celebrated the Pontifical Mass. direction are the mountains of the coast range. The SEMINARY BUILDINGS are of fireproof and earthquake proof construction, of reinforced concrete. No stone surfacing or other kinds of veneers have been used in place where they might be subject to displacement. The concrete designs are the product of an interesting method. The designs were first worked in clay, and from the clay models were cast reverse molds of hard plaster. The concrete was poured in these molds and allowed to harden. Then the plaster was stripped off, leaving the concrete patterned and ornamented like carved stone. the reredos of the chapel, carrying representations of the Last Supper and of Pentecost, and a statue of St. John the Apostle. The ARCHITECTS, Ross Montgomery and William Mullay, were chosen to prepare plans for the Seminary. ENTRANCE PLAZA. Immediately before the entrance lies a plaza, adorned with a marble statue of St. John and two standards from which fly the American and Papal flags. Note the suitable inscriptions at the base of each standard. These were the gifts of Very Rev. Martin C. Keating, pastor of St. Robert Bellarmine Church in Burbank, California. The statue is a copy of the statue of St. John, located in the Basilica of St. John Lateran. Before entering the main doorway, the visitor may cross to the edge of the plaza and see the RECREATION GROUNDS, separated from the Calleguas River (often a dry river bed or wadi) and the main thoroughfare by tall eucalyptus trees. Here will be noted the swimming pool, weight room, the baseball diamond, football and soccer field, handball, tennis and volleyball courts. The CENTRAL COURTYARD or cloister is planted with trees and grass, while in its center is an antique ornament from Italy (gift of Countess Estelle Doheny) - a carved well-head encircled by a series of Ionic shafts, the whole of white marble. On the four sides of this area are a succession of twin columns terminating with carved capitals from which spring ogival arches. On the eastern boundary of the courtyard is found a group of classrooms. The cloister on the north gives access to the prayer hall surmounted by the faculty residence which is windowed in part to look down into the garden enclosure. Two dormitory wings run at right angles from each end of the prayer hall toward the north. Each wing has two floors. One faculty member has quarters at the end of each floor. and the recreation hall enclose a third landscaped area. A statue of St. Patrick (carved by Carlo Taliabue and given by the Rev. Patrick O’Donoghue) is found east of the recreation hall. To the right of the statue lies the bungalow residence of the Archbishop. To the north the outdoor Way of the Cross wends its way downward through the grove. Midway down, and directly below the north facade of the library, the grove widens into a cool sequestered picnic area and the Grotto of Our Lady of Lourdes. It is an exact reproduction in size of the original grotto. FACULTY CENTER. Recalling our attention again to the central cloisters, from near their southeastern corner they open to, through a vaulted vestibulum, with a fourth area enclosed by the chapel, the refectory and a smaller one for the faculty, and, on an upper floor, the faculty center formerly the convent. This quiet court is traversed along its western side by a Sicilian arched ambulatory, clinging to the chapel wall. The courtyard pagoda and Asian garden reflect the significant presence of Asian seminarians in the seminary and throughout Southern California. Except for the chapel, the wings surrounding this courtyard also shelter other spaces: the kitchen, storage, laundry, maintenance facilities, and heating plant. Of varying functions, all these elements are separated from each other in three levels: storage, laundry, and heating-plant on the first floor; the refectories and kitchen on the next; and on the third floor, the faculty center. REFECTORY AND KITCHEN. The main refectory accommodates the entire seminary community. Over the main entrance will be seen a crucifix, formerly used in the R.K.O. studios in Hollywood. The adjacent kitchen is arranged to serve the dining room from the center of one side so that the distance to the farthest ends of the room is reduced to a minimum. Refectory, kitchen and boiler-stack are situated on the eastern side of the composite building group, permitting the prevailing westerly winds to carry away the cooking odors and chimney smoke. TOWER. In the adornment of the tower, on each of the four faces, inscribed above the lancet arches, is a stone medallion of Our Lady. Surmounting the tower, at the highest point of the entire seminary, is the Latin cross covered with gold. ORATORY AND SACRISTY. Through the archway at the right of the chapel entrance, is the Oratory. Three altars were provided in recessed chapels for the daily Mass of priest-faculty before concelebration became widespread practice. The altars are of marble slabs. The paintings over each altar are by Hector Serbaroli. The altar on the right is surmounted by a representation of the death of St. Joseph. Over the center altar is the painting of the Sacred Heart, surrounded by the various saints connected with the propagation of this devotion and including Pope Leo XIII. Over the third altar on the left is the picture of Our Lady of Guadalupe with Blessed Juan Diego and Archbishop Zumarraga. On the right are three windows produced by three different glass studios of Dublin, Ireland. These windows were part of an artistic contribution made by Irish artists to the New York World Fair, 1938. After the closing fair, they were secured by Archbishop Cantwell, and installed in this Oratory. The first window depicting the homage of St. Patrick to the Virgin Mother and Child was designed, cut, and completed in the Clarke Studios, Dublin. The center window is the product of the William Earley Studio of Camden Street, Dublin. Subject is the Annunciation. Next to the Earley window is the product of the Harcourt Craft Workers of Dublin. Subject is the Trinity of Irish Saints Brigid, Patrick and Columbkille. Passing through the south doorway we enter the Sacristy. Long rows of vestment cases contain the supply of linen and vestments made for the Seminary Community by the Marymount Tabernacle Society of Los Angeles. Here also may be viewed a precious chalice; a gift to Archbishop Cantwell from Pope Pius XII, on the occasion of the Centenary Celebrations in 1940. Its inscription records this information. On the walls to the left are framed the documents recording the consecration of the Seminary Chapel and the altars of the Oratory.